Second, as opposed to what I’ve seen before, Bespin (while in a very early state) shows lots of promise and possibilities. 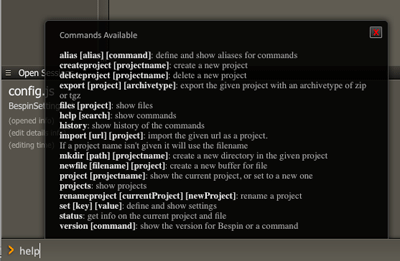 You can have a number of projects, files and settings, customize it with your own commands etc. It also has a quick keyboard switch (Ctrl + J, no matter the platform) to go between a command line and the editing area. 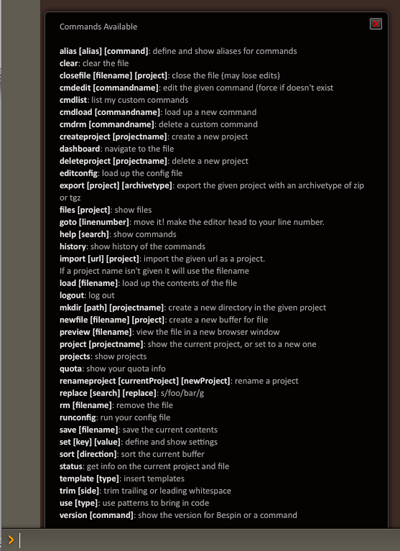 In the command line area, type “help” followed by Enter to see all available commands in your current context. goto [linenumber]: move it! make the editor head to your line number. import [url] [project]: import the given url as a project. Quite a lot, eh? Some of the more used ones are createproject, mkdir, newfile, save, load and preview. A short collection of hints can be found in MozillaWiki – Labs/Bespin/Tips. When it was initially released (Ajaxian release post and discussion), I couldn’t even write curly braces with it with a Swedish keyboard (wrote a comment, got no reply – probably the only one in that thread that didn’t get one 🙂 ), but that seems to have been resolved now. It supports color coding and some other niceties, but in the long run, naturally code completion and/or bundles (like in TextMate) would be needed to make it a real competitor. I guess this should work with Firefox, Safari, Opera and Chrome, due to what it’s based on, but I could only use it in Firefox and Safari 4 (no log in present in Opera, and stopped by a dialog in Chrome). For a lot of people, this gives them the opportunity to host and edit code directly in a web browser, and in future versions of Bespin, the possibility to share code and/or import open-source projects directly. For others, and this is the most important part, I think, it shows you the enormous potential one can get by using the canvas element (supported by all web browsers, except for, of course, Internet Explorer). Do you have any ideas for innovations to improve Bespin’s accessibility? Or ideas for the canvas element’s accessibility in general? Canvas accessibility has been an ongoing discussion in the HTML5 WG and WAI PFWG. We do have some ideas. There are several things that we can do, and one of them is to have an accessible mode that keeps a shadow div or textarea that is off screen. With some focus magic, the reader will see it as the editor and will be able to interact with it….. and we can use ARIA in that shadow to get things done. We need to play around, but this is a potential shortish term way to do this. We are very interested in a longer term solution to making canvas based apps accessible in the large. Thanks for the info Dion. Much appreciated. To be honest,I don't know that much about the inner workings of <code>canvas</code>, and while Dion's suggested short-term solution might help, I would love to see HTML 5 to incorporate this into the discussion. Support for non US keyboard layouts would be a good idea.